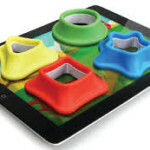 A new hybrid use for tablets combines the use of a tablet-based app and real-life physical manipulatives. Two products, Osmo and Tiggly, have math-based apps for early numeracy skills. The combination of low- and high-tech interactions with mathematics strengthens the connections between concrete, representational, and abstract mathematics, and also provides flexibility in instruction. For example, students can work with the physical manipulatives face-to-face with teachers and peers, and then use the same manipulatives to practice with the app. 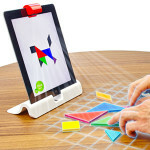 Osmo, by Tangible Play, currently available only on iOS, includes a physical base, in which the user places the iPad in its vertical position, and a red mirror that slides over the camera. 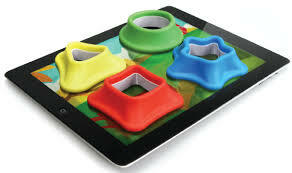 Osmo apps are free, and Osmo manipulatives (and the base and mirror) are available for purchase at the website. Osmo also offers a curriculum guide for teachers using Osmo in the classroom. The Osmo Numbers app includes durable cardboard tiles with both dots and digits and has students constructing, deconstructing, counting, adding, and multiplying values. For some games, red and yellow counters can be used in addition to, or instead of, the tiles. One draw back within the Numbers app is that, depending on the game, sometimes placing two digit tiles side by side results in a two digit number, and sometimes creates a multiplication. I wish the use of side-by-side placement was consistent throughout. However, the app uses multiple representations and flexibility with number providing ample, conceptual practice for students using both quantity (dots) and digits (numbers). The Osmo Tangram app allows students to see digital renderings of tangrams that they are manipulating, and fill a shape that is shown on the app. Tangram provides opportunities for students to develop spatial sense and to begin to talk about shapes and space. Although not math-related, the Osmo Words app allows teachers to build their own vocabulary lists with verbal and picture clues. Students use letter tiles to spell the word defined or pictured on the screen. Math vocabulary would be a good fit for this app. Also not directly math-related is the Osmo Newton app. Students draw diagrams in the physical world using any pencil and paper. The drawing shows up on the screen and a ball rolls along the lines in the diagram in real time. As students add to the drawing, the ball is forced in different directions. The objective is to keep the ball from falling through to the bottom of the page. This app has great potential for enhancing a mathematics discussion of increasing and decreasing directions or slope, and angles. Tiggly apps, available for iOS and Google, are free and can be used with the Tiggly math interactive toys (available for purchase): 5 rubber bars with 1 to 5 connected “circles” that can be “stamped” onto the tablet screen to match and create quantities. Tiggly integrates visual, auditory, and kinesthetic sensory experiences to build mathematical understanding of quantity, number, and basic operations. Users may also use their fingers as stamps instead of the interactive toys, although for some students, this may be physically challenging. Tiggly Chef is an addition app that has students use quantity and flexible thinking about quantity to help the chef use the right amount of ingredients in his crazy recipes. Tiggly Cardtoon is a counting app where students identify quantities and watch whimsical “cardtoons” form and re-form. Tiggly Addventure is a number line app where students must help build a path for creatures to cross the screen. Various aspects of number sense, including counting, operations, and skip counting, are utilized through a variety of representations to build mathematical understanding and get the creatures to the other side of the screen. For students with special needs, and their peers without special needs, apps that integrate real life, physical manipulatives that can be touched, felt, and moved along with the benefits of a digital app such as instant feedback, descriptive graphics, and interactivity, can meet a variety of physical and cognitive needs in the mathematics classroom. Tagged Kate Fanelli, mathematics, Osmo, Tiggly. Bookmark the permalink. Looks like Tiggly Math is coming out with Digits!